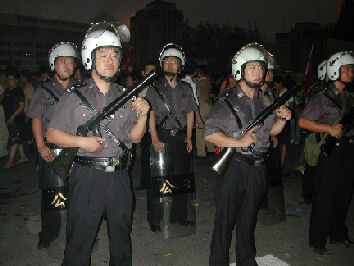 Beijing riot police By some estimates two million people have been arbitrarily detained in China. According to Amnesty International there are currently about 2,000 people in Chinese jails for political crimes and 230,000 people are in prison or labor camps who have not been charged of a crime. Thousands of Tibetan monks and nuns have been arbitrarily detained. police on Wangfujing Street in Beijing According to a 2005 report by Manfred Nowak, the first United Nations human rights investigator to visit China, torture by authorities on detainees is widespread and “a culture of fear” is pervasive. According to the report such abuses can only be eliminated by overhauling criminal laws, giving more power to judges and abolishing labor camps. Nowak complained that there were numerous attempts to “obstruct or restrict” his investigation. Torture methods used by Chinese authorities, according to the United Nations, have included denying food; using electric shocks, sleep deprivation, burning cigarettes, hoods, and blindfolds; submersing detainees in water or sewage; denying medical treatment, forcing detainees to maintain awkward position for long periods of time; exposing them to extreme heat and cold, and forcing prisoners to squat in a small metal box for days. People sentenced to death or waiting for an appeal are regularly handcuffed and shackled for 24 hours a day and can not eat or use a toilet without the help of other prisoners. Most tortures are designed not to leave any visible marks or scars. One tortured prisoner wrote in letter smuggled-out of his labor camp, "On Nov. 8 they begun taking me to the workshop and hanging me from a pillar with my hands cuffed above my head and my feet barely touching the floor, every day for more than 10 hours." "On March 12, they caught me writing a petition about prison conditions. They started beating and kicking me again, and hitting my head with an electric baton." A dissident told the United Nations investigation that he was forced to remain immobile in bed for 85 days with his hands held on the side of his head. If his hands moved while he was sleeping he was woken up and told to resume his assigned position. police brutality in Tibet Suspects are routinely tortured to extract forced confessions. According to the United Nations report, “Very often an individual police officer is not instructed to use torture but is under pressure to extract a confession, even though under Chinese law, confessions obtained through torture are inadmissable in court. According to the United Nations study 126 people were killed, including some during police interrogations, in 1993 from torture and 115 on 1994. Sleep deprivation is a common tactic used by government officials conducting interrogations. One government official told the Daily Yomiuri, “They deprive people of sleep by taking turns to question them. Most people usually give in after three or four days. Police officers can be swayed with connections, but you have to concede defeat if you are arrested by them [government officials]. In December 2003, a man was sentenced to death by China’s highest court even though eight prison guards admitted torturing him to extract a confession. A Chinese legal expert said the decision was made because the government didn’t want a precedent set that confessions could be disallowed if they were extracted by torture. Hang Xingshui, a defense lawyer, told the New York Times, Legal workers are often under so much pressure to get cases closed no matter what it takes. In China the stakes are high because so many people are put to death. In 1998, the government authorized the release of a book called The Law Against Extorting a Confession by Torture, which outlined 64 case studies of people being tortured. Victims described in the book were tortured to death using electric cattle prods, drowned in buckets, burned in stoves, hanged and beaten to death. “The new regulations were issued weeks after the authorities conceded that the confession used to erroneously convict a farmer for a murder was based on torture. The case came to light only after the supposed victim turned up alive and the defendant had spent 10 years in prison. It has provoked national outrage.” (See Henan Murder Victim Surfaces Alive, Crime). Chinese police have been accused of being involved in prostitution, gambling, drug dealing and smuggling. One policeman was sentenced to death after he killed a bicyclist while driving drunk. He reportedly was so intoxicated he dragged the victim 1,500 meters before bystanders told him to stop. In rural areas police have been accused of being “protective umbrellas” for criminal gangs. They have been arrested for heroin smuggling and counterfeiting and often fail to investigate murders. If people complain they are beaten, sometimes fatally by police. Corrupt officials and businessmen routinely use the police as their hired guns and pressure judges into putting innocent people behind bars.Police often act as protection services for the highest bidder rather than law enforcement agencies. Salaries often are paltry so they turn to local businessmen to employ them as enforcers and thugs. In some cases they have kidnaped customers who were behind in their payments and held them unto relatives paid up and tortured, imprisoned and publically humiliated business rivals. In June 2003, police in Chengdu arrested a woman?a drug addict?for theft and locked her three-year-old daughter at home with no food. The girls died after 18 days. The mother had asked police to contact her sister to take of the child but no one was able to find the sister and failed to tell anyone that could have helped the child. Internet chat lines were overwhelmed by chatter on the issue and criticism of the police. 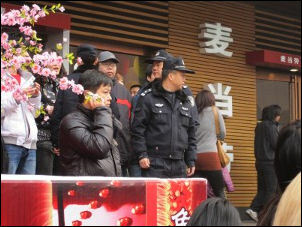 Wang, head of the police station in Liangzhu township, has been charged with “endangering public security by dangerous means” and could be given the death sentence if convicted, the official Xinhua news agency said.Migrant workers waiting to catch a bus to the eastern province of Zhejiang to pick oranges started to protest after police ordered a funeral home to remove the bodies, reports said. Fearing police were trying to destroy evidence, the workers smashed several police cars and hearses and riot police were called to “maintain order,” the Global Times said. Gruesome photos published by state media appear to show dozens of people standing around a severely battered police car and at least two people crushed underneath a streetlight. Police brutality is a serious problem. There a number newspaper stories in the early 2000s about police beatings and killings in Guangdong Province. The magazine Crime Research found that 47 percent of criminal suspects polled said they had suffered police brutality while being questioned. Even foreign journalists are not immune to brutal treatment from police. Todd Carrel, a former bureau chief in Beijing for ABC news, wrote in National Geographic, "In June 1992...I reported for ABC on a man who, all alone, showed up unfurl a protest banner...My price for documenting his actions was severe and unexpected. I was kicked and punched by a group of plainclothes policemen, one of whom flailed my head with a bag of rocks. The beating left me hobbled with lasting injuries. I still have difficulty walking, sitting and standing." In central Hunan Provence, two teenagers charged with robbery died within four days of each other. One had a large open wound and his wrists were black and blue. These and other reports of abuse goaded the Ministry of Public Security to launch a three-month campaign against prison abuse. Extracts from The Practice of City Administrator Law Enforcement “by the Beijing City Administration Bureau,” were posted by Zhao Yang, an enforcer from Nanjing, who said: “Even as a chengguan myself, I felt very shocked when I read the book.” but added, “The book also has useful instructions on how to control [difficult] situations and how to avoid further conflicts and even control your temper. gangsters impersonate police In December 2004, huge riots broke out in a village of migratory workers in Guangdong Province southern China after police allegedly beat to death a 15-year-old migrant accused of stealing a bicycle. Hong Kong newspapers reported that more than 50,000 migrant participated in the riot. In December 2004, seven people were killed and dozens were injured in a riot in Da Lang village in Guangdong Province southern China after police allegedly beat to death a relative of a student injured in traffic accident, following a dispute over compensation. In November 2004, two police officers were killed in Wanrong County in Shanxi Province when enraged construction workers attacked a police station after a traffic dispute. In June 2007, hundreds of students from universities in Zhengzhou, Henan Province battled police and burned cars after street inspectors beat up a female student. It was not clear why the female student was beat up. Students protests have been rare since Tiananmen square. In January 2008, large protests were held in front of the city hall in Tianmen, near Wuhan in Hubei Province after a man was beaten to death as he tried to photograph an altercation between villagers and officials with his cell phone. The victim, Wei Wenhua, a 41-year-old construction company executive, came across the scene by chance in his car. He stopped as 50 urban administrative inspectors, backed up by cheng guan parapolice, were preparing to confront a group of villagers---angry about heaps of garbage dumped near their home---trying to stop a truck from dumping more garbage. When the inspectors and parapolice saw the cell phone the turned on the executive and attacked him for five minutes. Family members of the victim said that thousands showed up at the protests. A Communist party official denied that any protest took place. The incident was picked up by bloggers and chat lines. Government authorities responded by placing 100 people under investigation and detaining or removing from office several government officials. In 2010, hundreds of citizens in Kunming, the Yunnan provincial capital, rioted after false rumors spread that chengguan officers had killed a vendor. More than a dozen police or chengguan officers were injured in the nighttime episode; 14 government vehicles were overturned or set on fire. Chinese policewoman kills In July 2008, Yang Jia, a 28-year-old unemployed man, forced his way into a Shanghai police station and killed six policemen in a stabbing spree. A local newspaper reported that the attack was revenge for torture and beatings by police in which he sustained a concussion and lost three teeth after being accused cutting in a train station line. On another occasion he was beaten and tortured after being accused of stealing a bicycle he had rented. In the latter case Yang tried to sue the police for psychological damage but the claim was rejected.